WBC lightweight champion Jorge Linares, (39-3, 26ko) defends his title against Mexico’s Ivan Cano (23-6-2, 15ko) at home in Venezuela tonight, in what will be only his 4th fight in his native land over the course of his 13 years as a professional. 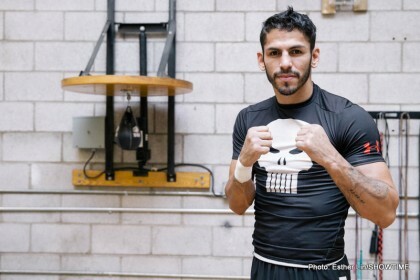 The Golden Boy promoted Linares – who resides in Japan – has said he is relishing the opportunity to box in front of his home fans and has promised that after he beats Cano tonight, he will continue to dominate at 135 lbs for some time to come. Linares is coming off of his victory over Britain’s Kevin Mitchell in May, in which he climbed off of the canvas to stop the Londoner in 10, and had briefly been linked to an immediate rematch with the Brit before opting to make the homecoming against fringe contender Cano, instead. The Mexican is taking a significant step up in class against the three weight world champion, who at 30 years of age is enjoying something of a career resurgence since picking up the [vacant] belt by stopping Javier Prieto in 4 rounds in December of last year. Incidentally, Cano drew twice with Prieto in the Summer of ’14, just before he was stopped by Linares, and the best name on his record is arguably Canada’s Dierry Jean – whom he was knocked out by in October 2012. Despite this, the Mexican says he is coming to win, and claims he is confident in upsetting the odds. The fight will air on ESPN3 in the States.